Leeds United owner Massimo Cellino has indicated Neil Redfearn is a genuine contender for the head coach's role at Elland Road. Academy boss Redfearn has been given the caretaker reins at Leeds for a third time after Dave Hockaday's exit. Redfearn made a winning start against Bolton on Saturday and Cellino praised him for playing in a "beautiful way". Cellino says he has been left "confused" by the number of calls he has fielded regarding the vacancy and could be tempted to look in-house when it comes to making a full-time appointment. 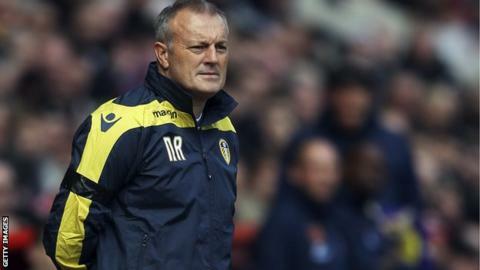 Former Barnsley and Crystal Palace midfielder Redfearn, 49, has previously said he will do whatever is asked of him by Cellino, although he is strongly committed to his role at the club's academy. Former West Bromwich Albion boss Steve Clarke and recently-departed Watford head coach Beppe Sannino have been among the bookies' favourites for the vacancy, although it is believed ex-Liverpool and Chelsea assistant manager Clarke is not interested in the role. Cellino would prefer to appoint another British coach although fellow Italian Sannino cannot be ruled out after guiding Watford to second place in the Championship prior to his departure. Hockaday, 56, was a shock appointment in June with his only managerial experience at non-league Forest Green, and he was sacked after only six games in charge of the Championship club.